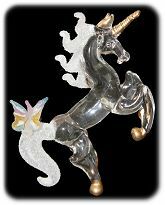 Exquisite spun glass Unicorn with a frosted mane, has gold tipped horn, hooves and ears with a rainbow pastel butterfly companion. All set on a round glass mirror base which can be illuminated from below with a light base. 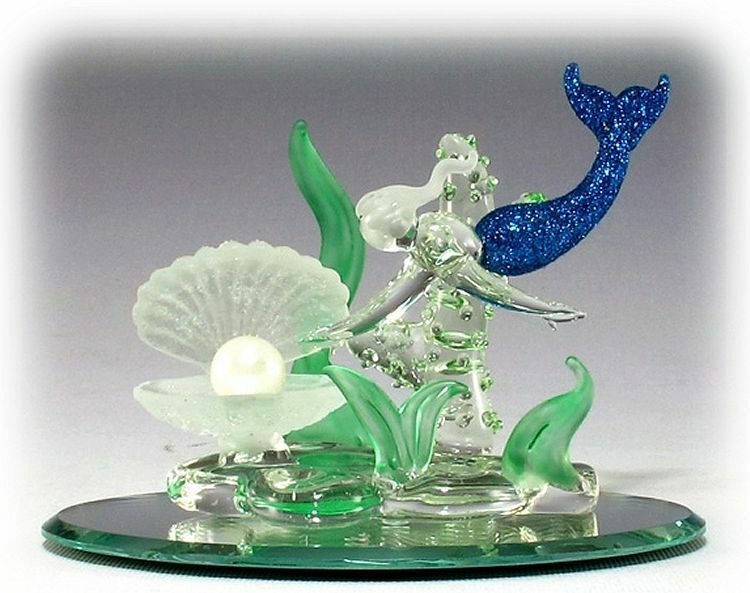 This hand made glass creation is a perfect gift or party favor packaged in a glossy gift box. Spun glass Art Deco style frosted Cinderella coach with graceful frosted mane steed and a frosted pumpkin shaped carriage, has delicate gold accents on an oval mirror base. This hand crafted spun glass figurine is a perfect gift or wedding favor. 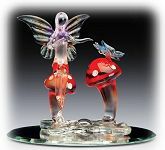 Spun glass Crystal Winged Fairy sits on a colorful pansy and cavorts with a Lady Bug friend. 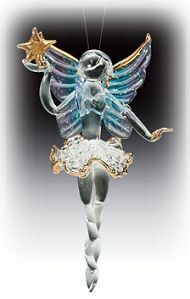 This hand crafted glass figurine can be illuminated with an LED light base and is a welcome gift or party favor. 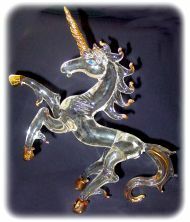 Large hand spun glass Unicorn has a gold tipped mane, tail and hooves. 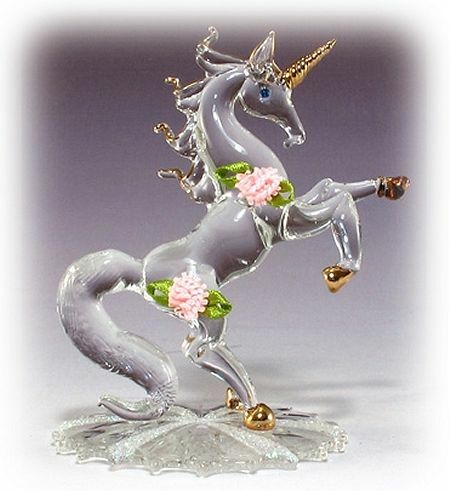 This charming Unicorn figurine is adorned with pink ribbon bouquets and crystal blue eyes and is set on an embossed star shaped glass base. 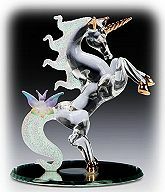 He is a welcome addition to any Unicorn lover's collection! 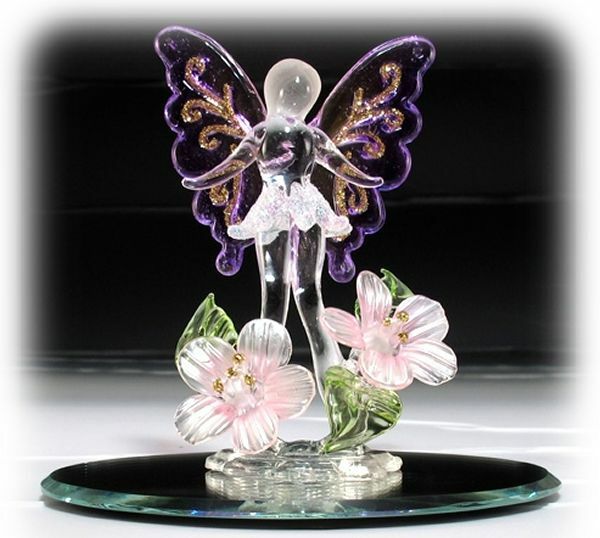 Spun glass Butterfly Fairy with paisley style gold sparkle motifs on clear purple wings. She stands amid pastel pink pansies with gold accented center. The arrangement is set on an oval glass mirror base. 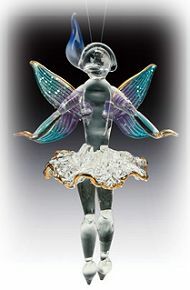 Hand made spun glass fairy figurine in glossy gift box. 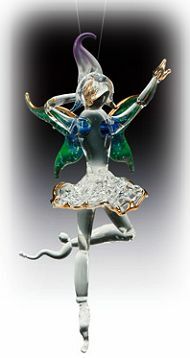 Spun glass Green Leaf Fairy in green sparkle dress, sits atop a magical purple toadstool studded with shining crystals and is set on an oval glass mirror base. 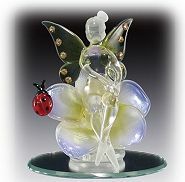 Hand made spun glass fairy figurine in glossy gift box. 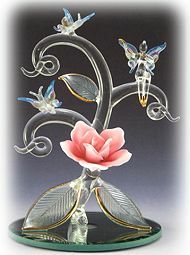 A Rainbow winged Fairy sits near a porcelain-like pink rose while visiting with 2 blue hued Butterfly friends. 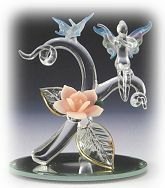 This large spun glass figurine includes gold accents on fluted rose leaves and sits on a beveled round mirror base that can accommodate an LED light base. 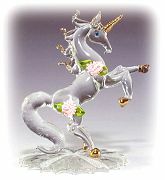 Huge 10" high glass elegant Unicorn figurine is adorned with 14K gold tipped horn, ears, hooves, mane and tail as he kicks his hooves in glee. 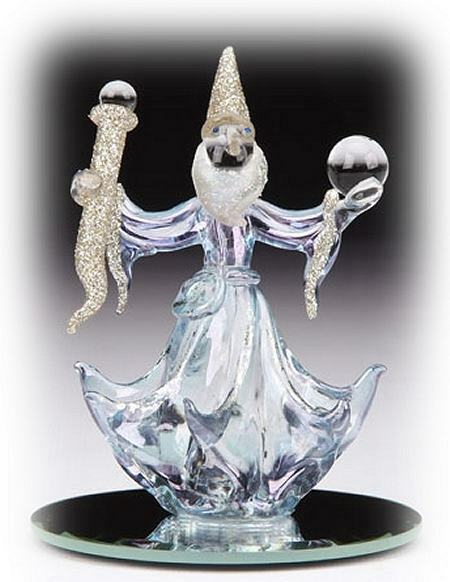 This hand crafted glass figurine can be illuminated with a large LED light base and is a prized addition to any unicorn collector!.